The Wright State Core is an integrated program of courses and experiences that provides students with the breadth of skills, knowledge and understanding expected of university graduates. A university degree goes beyond preparing graduates for a profession; it transforms their lives and their communities. The Wright State Core helps students develop the knowledge and skills essential for critical thinking, creative problem solving, meaningful civic engagement, multicultural competence, appreciation for the arts, and life-long learning. Wright State graduates will have the ability to apply insights from multiple disciplines to engage effectively with a diverse world. 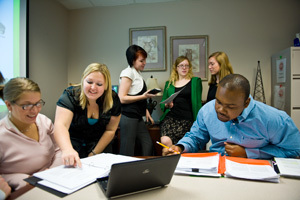 As a part of the requirements for a baccalaureate degree at Wright State University, students must complete a minimum of 38 hours of course work in the Wright State Core program. The specific requirements must be completed prior to graduation. Students should complete English 1100 and 2100 and the Core mathematics requirement by the time they have earned 45 credits at Wright State University. Honors sections of Wright State Core courses are available for both entering freshmen and continuing Wright State students who meet Honors Program criteria. Honors sections have smaller enrollments; encourage student participation; offer more sophisticated and complex assignments; and provide greater opportunities for analysis, synthesis, and creative expression. Honors students may also choose to use UH 2010 and 2020 to meet requirements for Elements 4 and 5, respectively. For more information consult the University Honors Program information in the Academic Programs section of the Undergraduate Catalog.